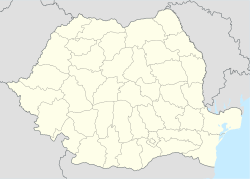 Târgu-Mureș (Romanie pronunciation: [ˈtɨrɡu ˈmureʃ] ( listen); Hungarian: Marosvásárhely, Hungarian pronunciation: [ˈmɒroʃvaːʃaːrhɛj] ( listen); German: Neumarkt, Neumarkt am Mieresch; Laitin: Novum Forum Siculorum) is the seat o Mureș Coonty in the north-central pairt o Romanie. It is the 16t lairgest Romanie ceety, wi 134,290 indwallers as o 2011. ↑ "Romanian census 2002". Edrc.ro. Retrieved 18 November 2011. ↑ "Târgu Mureș sister cities". Retrieved January 5, 2015. ↑ "Marosvásárhely" (in Hungarian). Ujbuda.hu. Retrieved 18 November 2011. ↑ "Marosvásárhely". Egerszeginfo.hu. Retrieved 18 November 2011.